Critical Elements (TSXV:CRE, OTCQX:CRECF, FWB:F12) is a Canadian resource exploration company focused on advancing its Rose Lithium-Tantalum Project in mining-friendly Quebec, Canada. The Rose deposit, one of the largest conflict-free tantalum resources in the world, can supply multiple lithium markets because of its unique purity and its low production cost. The Rose deposit has an updated NI 43-101 resource estimate of 31,900,000 tonnes of indicated resources containing 1.04 percent lithium oxide equivalent or 0.93 percent lithium oxide, and 148 ppm of tantalum pentoxide; and 2,800,000 tonnes of inferred resources containing 0.92 percent lithium oxide equivalent or 0.82 percent lithium oxide, and 145 ppm of tantalum pentoxide. Following a positive feasibility study, Critical Elements is now ready to advance to the next stage of their Rose Lithium-Tantalum project. The team is preparing to commence the definitive feasibility study for the Phase 2 carbonate plant in Q1 2018. The feasibility study was in part informed by the results of a bulk sampling and pilot plant study. The results released in April 2017 demonstrated that the conversion of the resources from the Rose deposit into the spodumene crystalline phase is easily achievable, with lithium grades up to 6.56 percent. Extraction was achieved at very high conversion rates for Chemical and Technical Grade Spodumene, yielding 83.4 percent with a concentration grade of 6.41 percent for Rose and recovery averaged 81.9 percent with a concentration grade of 6.56 percent for Rose South. The high yield confirms the low-impurity profile of the Rose ore, allowing for the production of battery quality lithium carbonate at a competitive cost and without additional purification steps. Critical Elements has also partnered with another company working on a lithium project in Quebec, the Lemare Project, where two drilling programs were performed in 2016-2017 to define a JORC Code-compliant resource. Emerging as critically important resources for 21st century technology, lithium and tantalum are expected to see unprecedented demand in the near future. The battery-grade market represents approximately one-third of the total global end-use market for lithium, while the ceramic and glass market accounts for another one-third. Both of these markets have high entry barriers as end users expect high-purity, low-contaminant products. Available supply of Spodumene technical grade to the glass and ceramic market has been limited due to recent mine closures that have left only one major low-iron spodumene source, the Greenbushes deposit in Australia. While supply for battery-grade lithium has been short, prices have been growing significantly, whereas analysts predict double-digit growth over the next five years. By completing this form, you are giving consent to receive communication from Critical Elements using the contact information you provide. And remember you can unsubscribe at any time. Tantalum is used in a wide variety of applications across the electronics, medicine, engineering and energy-generation industries. Nearly half of tantalum consumption comes from the electronics industry. Since 1995, the market for tantalum has experienced average yearly growth in demand of about 8 to 12 percent. End users are facing increasing market pressure to secure conflict-free sources of tantalum, further tightening global supply. Critical Elements is focused on developing supply for these markets at its Rose Lithium-Tantalum Project. The unique geological properties of this deposit give it the potential to supply multiple markets, including battery grade, ceramic and glass and tantalum. The Rose Lithium-Tantalum Project is located in the James Bay area of Quebec, Canada about 22 miles north of Nemiscau and 47 miles due south of Goldcorp’s Eleonore gold deposit. Excellent infrastructure is in place locally and regionally, including 100-ton capacity road access, an airport, a mining camp and a power line directly on the project property. The Rose Lithium-Tantalum Project is located in the Quebec Plan Nord designated area, where the government is fast-tracking the construction of new infrastructure, accelerating permitting and assisting with project financing. 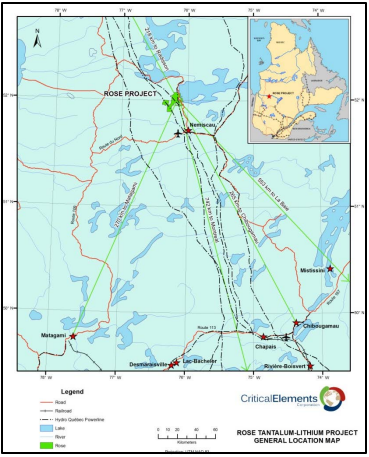 The project covers about 109 square miles of active mining titles in the northeastern part of the Archean Superior Province of the Canadian Shield craton and within the southern portion of the Middle and Lower Eastmain Greenstone Belt. The Rose deposit has an updated NI 43-101 resource estimate of 31,900,000 tonnes of indicated resources containing 1.04 percent lithium oxide equivalent or 0.93 percent lithium oxide, and 148 ppm of tantalum pentoxide; and 2,800,000 tonnes of inferred resources containing 0.92 percent lithium oxide equivalent or 0.82 percent lithium oxide, and 145 ppm of tantalum pentoxide. In September 2017, Critical Elements announced the completion of a positive feasibility study for its Rose Lithium-Tantalum project with a pre-tax NPV at eight percent of $1.257 billion and a pre-tax IRR of 48.2 percent. The study is based on a conventional truck and shovel open pit operation that will process 1.61 million tonnes a year in a conventional milling process with the aim of producing technical and chemical grade spodumene and a tantalite concentrate. The mine is expected to excavate a total 26.8 million tonnes ore of an average grade of 0.85 percent lithium oxide and 133 parts per million of tantalum pentoxide. Critical Elements has submitted their environmental and social impact study to the federal and provincial environmental agencies in July 2017 and expects permitting to take 18 months. Intensive metallurgical testing and flow sheet optimization work has shown that Critical Element’s Rose Lithium-Tantalum project demonstrates a significant advantage over other known lithium deposits based on its ability to produce premium-purity lithium carbonate at a low cost. During flotation testing, recoveries reached up to 91.9 percent lithium with a concentration grade of 6.43 percent lithium; recoveries averaged 90.88 percent with a concentration grade of 6.2 percent lithium. Results from recent hydrometallurgical testing for the conversion of Spodumene to Lithium carbonate have shown an overall recovery rate of up to 88.4 percent with an overall purity of 99.9 percent—surpassing the requirements for battery-grade lithium carbonate. The high purity percentage is due in large part of the low impurity profile of Critical Elements Spodumene in combination with the use of a sodium carbonate alkaline process rather than the industry-standard sulfuric acid process. The sodium carbonate alkaline process poses a much lower environmental risk and is much more successful in dissolving impurities at the leaching stage. In late 2016, Critical Elements initiated a bulk sampling program of 50 tons of material from two different zones of the deposit, Rose and Rose South, for subsequent pilot plant testing. The results of the pilot project will be used to decide the plant equipment for large-scale production. The proposed plant design includes simple grinding, and magnetic and gravity separation. Critical Elements innovates by introducing circulating fluid beds, common in many other industries, such as aluminum, but rare in lithium extraction, where rotary kilns are preferred. Fluid-bed calcination would cut down on energy use and modestly reduce capital costs, helping the company deliver high-quality lithium at low cost. In April 2017, Critical Elements announced the successful completion of its pilot work, with results in spodumene concentrates grading up to 6.56 percent lithium. From Rose, recovery rates averaged 83.4 percent with a concentration grade of 6.41 percent. From Rose South, the recovery averaged 81.9 percent with a concentration grade of 6.56 percent. In May 2017, Critical Elements announced the subsequent completion of its pilot work for the thermal conversion of alpha to beta spodumene followed by the conversion to Lithium carbonate battery quality achieving a high quality product 99.9 % at superior recovery rates without the need to apply additional cost intensive purification steps. “The high yield we achieved during extraction confirms the low-impurity profile of our ore, which is what allows us to produce battery quality lithium carbonate at a competitive cost, without additional purification steps,” said Jean-Sébastien Lavallée, who additionally noted the pilot work achieved conversion rates for alpha spodumene of 97 percent or better, followed by the conversion to Lithium carbonate battery grade quality with total recovery rates of 88.4%. Including modeling results done by Outotec for the flotation process of Spodumene total recovery rates are 92%, well above the industry standard of 60 to 65% percent. Most of the world’s supply of lithium comes from deposits with a significant potash co-product. The Rose deposit, however, possesses a unique combination of tantalum and lithium mineralization. The tantalum found in the Rose deposit gives the project additional byproduct diversification and makes it one of the few economic, conflict-free, industrial-scale tantalum sources in the world. The most recently reported metallurgical results from pilot work for tantalum at the Rose deposit show tantalite magnetic recoveries as high as 69 percent with an average of 64 percent, up significantly from the 50 percent recoveries reported in the 2011 PEA. Recent tantalum mine closures in Canada, Mozambique and Australia are creating a major shortage of supply from which Critical Elements might benefit. The Lemare Lithium Project is a joint venture between Critical Elements and Platypus Minerals. The 30.14square-mile project is located in Quebec’s James Bay area, a district containing several advanced-stage lithium deposits. The property hosts a 1.2-kilometer strike length of spodumene-prospective pegmatite. The Lemare project is secured by a February 2016 option agreement by Critical Elements and Platypus subsidiary Lepidico Ltd., in which Platypus earns up to 75 percent of the project. To earn an initial 50 percent interest, Platypus is to fund $800,000 for exploration costs by August 31, 2017, and invest an additional $1.2 million and delineate a JORC Code Compliant Minerals Resource by August 31, 2018. Platypus may then earn a further 25 percent interest in Lemare by paying $2.5 million (in cash or shares) to Critical Elements and completing a definitive feasibility study and environmental study by June 2020. The presence of high-grade lithium at Lemare has been confirmed through channel sampling and drilling during a stage one exploration program. Consistent grades of 2 percent to 3 percent were encountered along a 600-meter long zone, representing new highly prospective mineralization and an attractive target. The company plans further prospecting, trenching and detailed mapping in the South West zone to determine the length and width of the pegmatite ahead of drilling. Jean-Sébastien Lavallée, P. Geo., has been the Chief Executive Officer of Critical Elements Corporation since 2009. From 2009 to 2017, he also served as President of the Company. Mr. Lavallée has also been the Executive Chairman and Exploration Manager of Canada Strategic Metals (TSX-V: CJC) since 2017, having previously been President and Chief Executive Officer of that company since 2012. Mr. Lavallée has been active in mining exploration since 1994. M. Lavallée sits on the Board of Directors of the Quebec Mineral Exploration Association « AEMQ » since October 2017. He is also Vice President of Consul-Teck Exploration Inc., a Val-d’Or-based consulting firm founded in 2003 that specializes in mining exploration in northern areas, with most of the firm’s mandates involving the generation and execution of projects in remote areas. Mr. Lavallée has worked as a geologist for many companies, including Eloro Resources Ltd., Uracan Resources Ltd., Agnico-Eagle Mines Ltd., Noranda Minerals Inc., Champion Minerals Inc., Matamec Explorations Inc. and Atlanta Gold Inc. Mr. Lavallée has been responsible for the planning and execution of many exploration programs in recent years and has acquired solid experience in exploration project development. Jean-François Meilleur has been Vice President of Critical Elements Corporation since 2012. He has also been President and Chief Executive Officer of Canada Strategic Metals since in 2017. In addition, he is Managing Partner and co-owner of Paradox Public Relations. His many accomplishments include playing a key role in project development, strategic marketing and management leadership. He has been a valuable contributor on various projects to raise funds through the capital markets. Mr. Meilleur has a Bachelor’s degree from HEC Montreal, a leading French-language business school, with a specialization in marketing and finance. Nathalie Laurin has more than 25 years of experience in administration and accounting. During her career, she has held a range of jobs that have gained her experience in the financial industry, project management and in the natural resource sector. She has been self-employed since 2006, handling bookkeeping, audit file preparation and management of legal, regulatory and administrative matters. Richard Saint-Jean is a metallurgist technician with over 20 years of mining experience. He is currently the general director for BlackRock Metals, a private iron ore mining company. Previously, Saint-Jean was mill manager for the Troilus open-pit gold/copper mine in Chibougamau, where he worked for over 14 years. He has worked on four mill startups: Meston Resources, the Graphicor mine, the Cambior mine and the Troilus mine. At Troilus, he participated in the two mill expansions as well as the closure plan. Saint-Jean has worked closely with First Nations, including the Cree communities, for over 15 years. Jean-Raymond Lavallée has more than 30 years of experience in mining exploration, and has been a contractor, consultant and manager for several mining companies, such as Louvem, Soquem, James-Bay Development, Sullivan Consolidated, Cache Explorations, Parquet Resources, Dumont Nickel, Westminer Canada, Baribec Management, Exploration Ojibway and others. He was also controller for Mines Expert during the construction of the Doyon mine. Lavallée is currently president of Consul-Teck Exploration, a consulting firm of Val-d’Or founded in 2003 that specializes in mining exploration in northern areas. Marc Simpson is president and chief executive officer of Uracan Resources. Simpson has worked in the mining and exploration industry for over 23 years. He has worked for junior, mid-tier and senior mining companies on projects both in Canada and worldwide, including Bema Gold (sold to Kinross for C$3.5 billion in 2007), B2Gold and Echo Bay Mines. Simpson has been involved in exploration and mining projects, from grassroots exploration through to mine development and production. He obtained his B.Sc. in geology from the University of Manitoba and is a member of the Association of Professional Engineers and Geoscientists of British Columbia and the Association of Professional Engineers and Geoscientists of the Province of Manitoba. Matthew Lauriston Starnes is a lawyer with over 17 years of experience. Mr. Starnes is currently a Peerpoint lawyer with Allen & Overy in Tokyo specializing in mining law. Prior to this he was legal counsel in Sumitomo Corporation’s Mineral Resources Division in Tokyo, Japan. Among other things, he was responsible for legal aspects of Sumitomo’s investment in the Sierra Gorda copper project in Chile was also part of the team for the Ambatovy project in Madagascar. Prior to joining Sumitomo, he also was the General Counsel and Deputy CEO for the Ambatovy project. Mr. Starnes has also practiced as a corporate lawyer with major law firms in Montreal. Dr. Brune was Chief Financial Officer of Rockwood Lithium from 2011 until the acquisition of Albemarle in 2015. He left Albemarle in 2016 once the lithium business was successfully integrated into Albemarle‘s organizational structure. Prior to joining Rockwood Lithium, Dr. Brune had worked in different executive positions in corporate finance and M&A for Rockwood Holdings and its predecessor companies since 2004. Prior to that, he was with McKinsey as a strategy consultant for organizational development and management. Dr. Brune completed his doctorate in material sciences at the Technical University of Dortmund, Germany, after earning a physics degree. *Disclaimer: The profile provides information which was sourced and approved by Critical Elements Corporation in order to help investors learn more about the company. Critical Elements Corporation is a client of the Investing News Network (INN). The company’s campaign fees pay for INN to create and update this profile page, to which links are placed on Investingnews.com and channel newsletters.